Walk down memory lane… And let the movie nerd debate begin. with this EPIC edition of REWIND & RANK! These are personal TOP 10s ranking Oscar-nominated movies right alongside popcorn-munching blockbusters, indie films, b-movies, and cult classics. You never know, you might even uncover a hidden gem or two. The 1950s have some all-time greats of cinema. There are some truly legendary films that premiered in the decade. 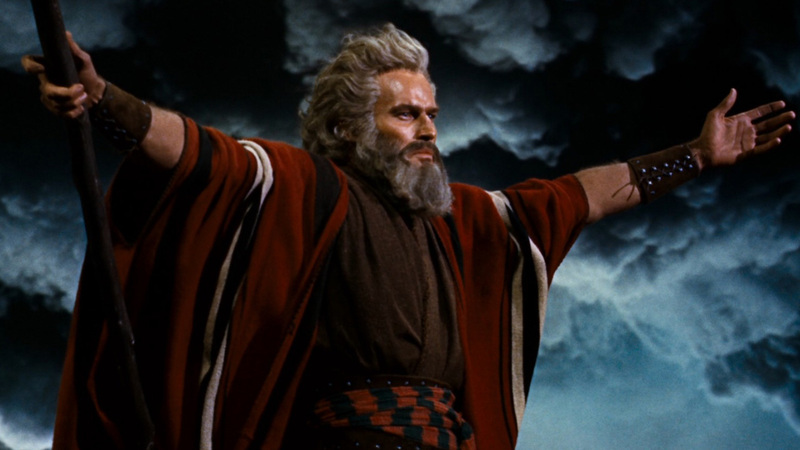 The #1 movie for the 50s was THE TEN COMMANDMENTS with $43 million (not adjusted for inflation). My Notable Must-Watch list is filled with films that have withstood the test of time. Every year (up to today) there are several must-see movies that slipped through the cracks for me. The further back we REWIND history, the more films I need to see. If you review movies from the 1950s, leave a LINK to your site in the comments below. My TOP 10 is followed by HONORABLE MENTIONS and the Best of ART VS POPCORN. Handout photo of Ben Chapman in costume for the title character in “The Creature From the Black Lagoon.” For obit. of Chapman. E-mail from Bob [mailto:kogar@earthlink.net] via writer Dennis McLellan. 5 FINGERS / AFFAIR IN TRINIDAD / AGAINST ALL FLAGS / ANGEL FACE / THE BAD & THE BEAUTIFUL / BEND OF THE RIVER / THE BIG SKY / DON’T BOTHER TO KNOCK / EUROPE ’51 / FANFAN LA TULIPE / FORBIDDEN GAMES (JEUX INTERDITS) / THE GOLDEN COACH / THE GREATEST SHOW ON EARTH (#1 movie – $14 million) / HIGH NOON / IKIRU (TO LIVE) / IVANHOE / THE LIFE OF OHARU / LIMELIGHT / THE LUSTY MEN / MACAO / MILLION DOLLAR MERMAID / MONKEY BUSINESS / MOULIN ROUGE / THE NARROW MARGIN / ONE SUMMER OF HAPPINESS / PHONE CALL FROM A STRANGER / RANCHO NOTORIOUS / THE QUIET MAN / SAILOR BEWARE / SINGIN’ IN THE RAIN / SNOWS OF KILIMANJARO / THE SOUND BARRIER / THE STORY OF ROBIN HOOD & HIS MERRIE MEN / SUDDEN FEAR / THE THIEF / THE TRAGEDY OF OTHELLO / UMBERTO D.
Humphrey Bogart (Joseph), Peter Ustinov (Jules) and Aldo Ray (Albert) are three prisoners who escape. They want to rob a store by pretending to be fixing the roof of a merchant. Now they can take insight into the private life of the family.